Under strict rules, limited resources, and an intense six-week time limit, FIRST Robotics Competition (FRC) teams of 20 or more high school students are challenged to raise funds, design a team “brand,” hone teamwork skills, and build and program industrial-size robots to play a difficult field game against like-minded competitors. 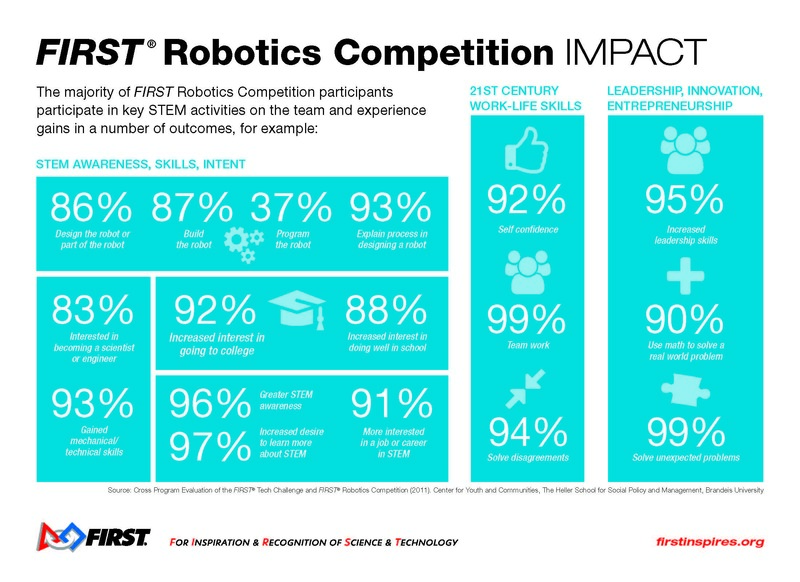 The high school level FIRST Robotics Competition (FRC) combines the excitement of sport with the rigors of science and technology. Under strict rules, limited resources, and a short 6-week build period, teams of 25 students or more are challenged to raise funds, design a team “brand,” hone teamwork skills, and build and program large scale robots to perform prescribed tasks against a field of competitors. FIRST Robotics Competition (FRC) team SigmaC@TS , who take their name from the “SIGMA” quality control program used by corporate sponsor Motorola, and the team’s Dillard school mascot, the Panther, kicked off the FIRST program in Florida in 1995. The team originally had to go to Boston to compete, since there were no competitions in Florida at that time. FRC began in earnest in Florida in 1999 with 28 teams at the Kennedy Space Center Center before moving to Epcot at Disney World. In 2003, the Florida Regional Competition moved to the University of Central Florida Arena (now the CFE Arena) in The event was renamed the Orlando Regional in 2012, and the South Florida Regional was also added at that time. well as additional out of state Regional events. The 2017 Season Challenge is called FIRST Steamworks . Visit the FIRST Robotics Competition page at FIRSTInspires.org or contact one of the Regional Directors listed at the top of this page.